Making water available may be the most effective way to attract birds to the backyard. The need for and attraction of open water anytime of the year is so strong that many species that do not visit seed feeders will show up just for the water. Birds must drink year ’round to avoid dehydration, and because they do not have salivary glands, they need water for digesting food. Water also is necessary all year to maximize feather maintenance. A bath, followed by careful preening, keeps feathers functioning to help regulate a steady body temperature. is close to the ground, but you may want to compromise on the elevation in order not to expose the birds to cat attacks. Remember that birds that are soaked are no match for the quickness of a cat or the stealth of a hawk. Locating the bath under cover of trees or patio roofs will improve security if hawks are present in your neighborhood. The bath should be reasonably close to trees or shrubbery to provide an easily reached perch to preen in safety. The bath should be away from any feeders. Birdbaths can be as simple as the clean lid of a plastic or galvanized steel trash can or as elaborate as a ceramic bowl atop a decorative pedestal. The best ones have a gradual slope and are no deeper than two to three inches. Birds like to stand in the water as they bathe and actually seem to prefer a non-slip surface. Even bathtub or shower non-slip strips help. heater either an immersion type of a birdbath with a heating coil built into the base. These work fine down to about -20°, and most have a thermostatic turn-off in case the water container either runs dry or gets tipped over. Remember, a ceramic or concrete bath may crack when water freezes in it , especially if it has a lip. A mister is another option, especially if you have hummingbirds around. Birds tend to “come running” when they hear the sound of moving water. And the hummers, along with some other small birds love to fly through a mist or bathe among wet leaves. 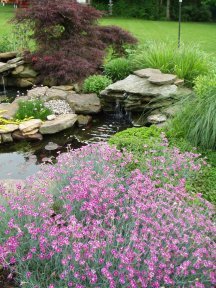 You can go all the way and create a water garden, perhaps with a re-circulating waterfall, pond or creek complete with water pumps, drippers, misters and landscaping. A reliable water source not only draws significant numbers of birds, it makes your yard an attractive nesting habitat. During the summer, you may have visit s from adult birds bringing their fledglings for a drink or bathing lesson. It is amazing how crummy the water in a birdbath can become. You wouldn’t think birds would get so dirty, but some species in particular spend a lot of time digging around in the leaves and garden searching for prey. A bath can quickly become fouled with leaves, defecation, feathers and debris. 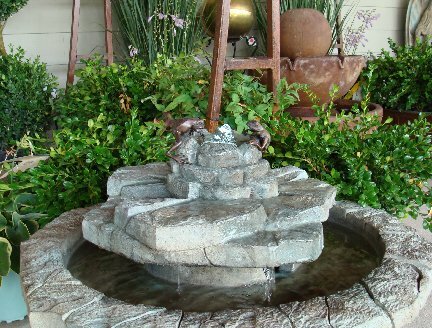 A birdbath can be cleaned on a regular basis with just a blast from a garden hose, before refilling with clean water. Once in a while – you can tell simply by looking – the bath will need to be scrubbed with a stiff brush. Be sure to enjoy the antics for our feathered friends in every season!